Create vector patterns or animations using a node-based interface! 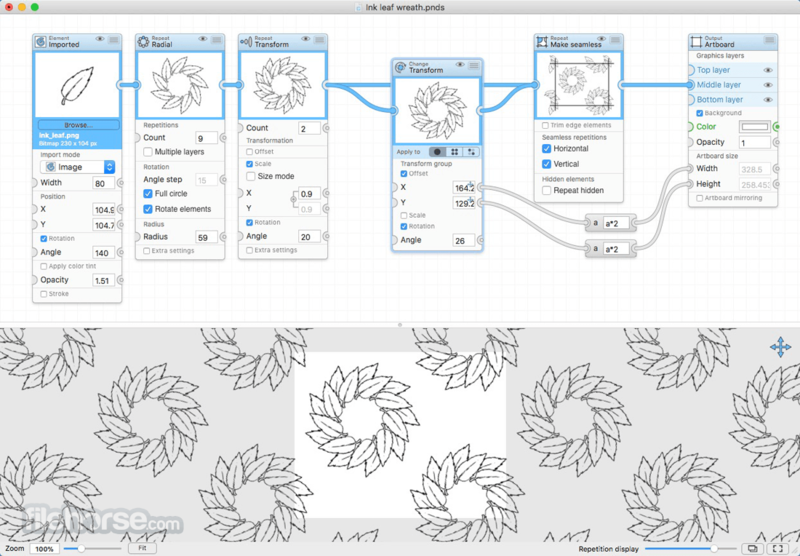 Patternodes for Mac is a software for creating graphical vector patterns, animations or illustrations. This is done using a node-based interface where you define a sequence of connected nodes that describe the design, each representing graphical elements, changes or repetitions. The node sequence is completely non-destructive, so you can change any step in the sequence at any time without having to redo the rest. The parameters that control each node can also be connected to other nodes, establishing complex relationships, or animated to create animations. Download Patternodes for Mac today! Patternodes is designed from the start to stimulate playful use and experimentation. Therefore the result is always shown in the preview view, repeated for patterns and updating in real time. Flexible node-based interface for non-destructive transformations and repetitions. Real-time updated tiled preview of the result while adjusting parameters. 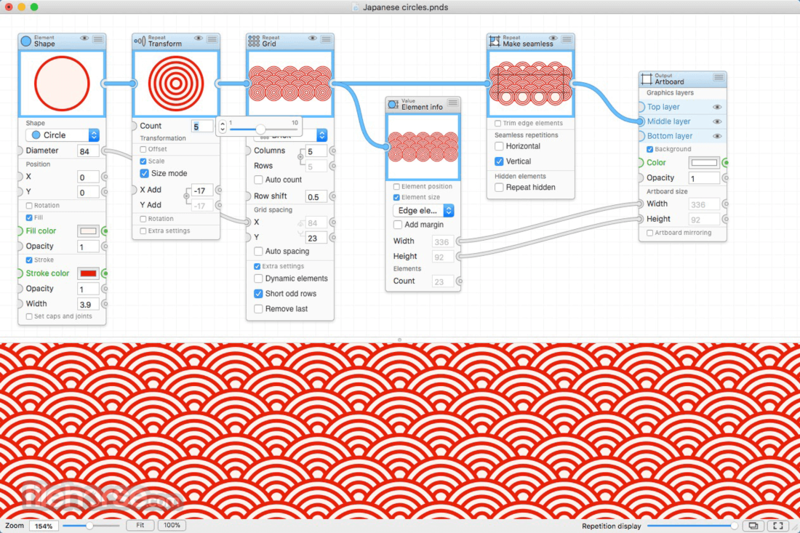 Add animation any parameter to create animated patterns or designs. 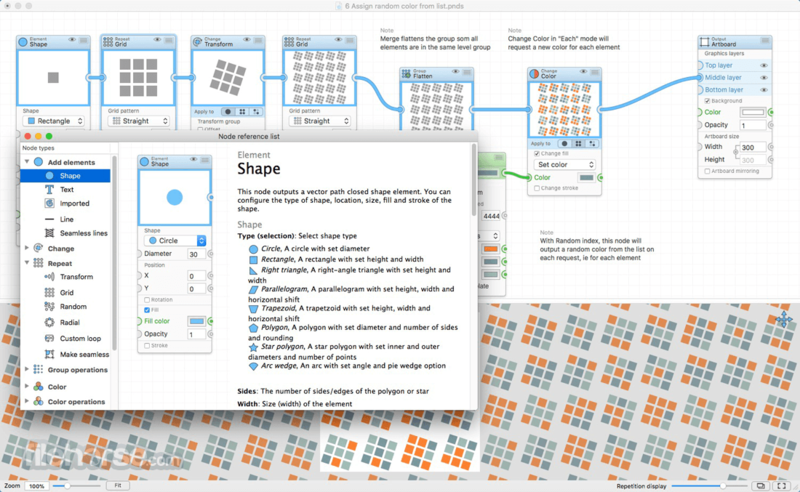 Built in nodes to create shapes, lines, curves or text to build your pattern with. Import or paste in bitmap graphics (JEPG, TIFF, PNG) or vector shapes (EPS, PDF or SVG) to use in your designs. 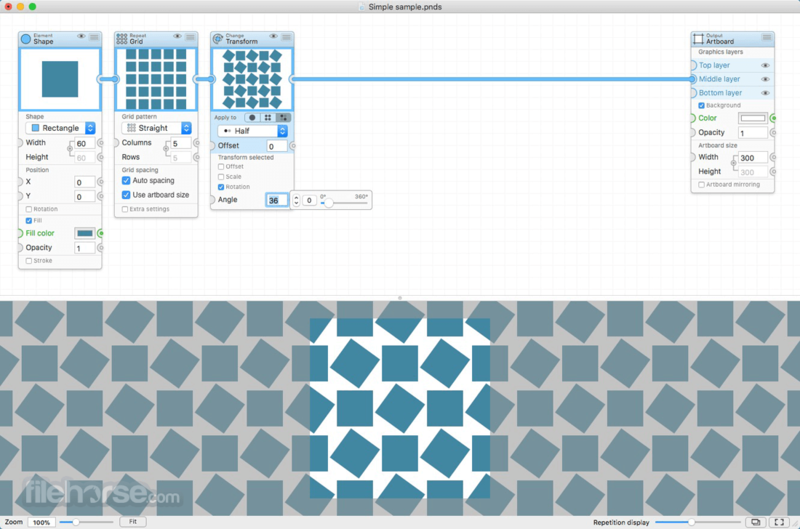 Automates making seamless pattern tiles. Define complex relationsships by making connections between nodes. Nondestructive randomization functions to randomly scale, rotate, move or adjust the color of the individual elements of your patterns. Export the result as bitmap (JPEG, PNG, TIFF) or vector (EPS, PDF) graphics, or just copy it and paste it into some other application. Export animations as GIF, QuickTime MOV, MPEG4 or numbered PNG, JPG or PDF files. Extensive manual, sample files, node reference guide and other inline help features to help you get started. 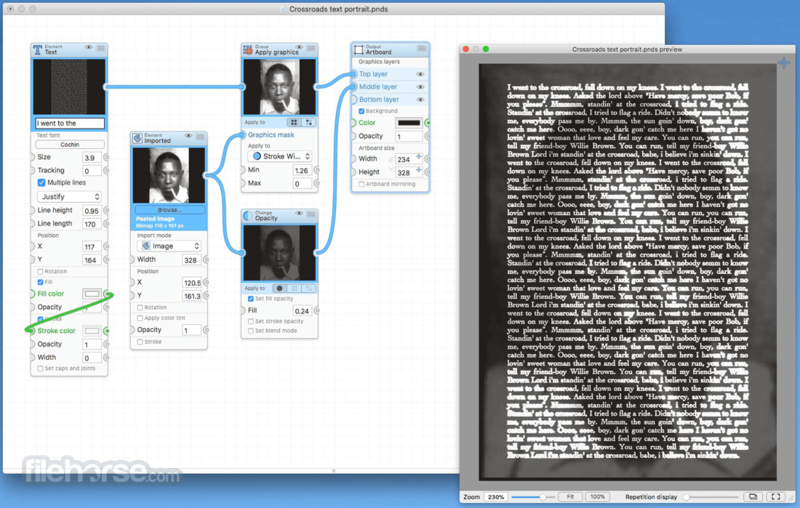 Note: In demo version, watermarks and removes elements from the exported patterns.